One of the things that gets me mostly excited about the Holidays is having family over. I feel so grateful that my home is the place to welcome all from near and far, and for about ten days of fun, food, laughter and total chaos, I can truly say it is the best time of year. 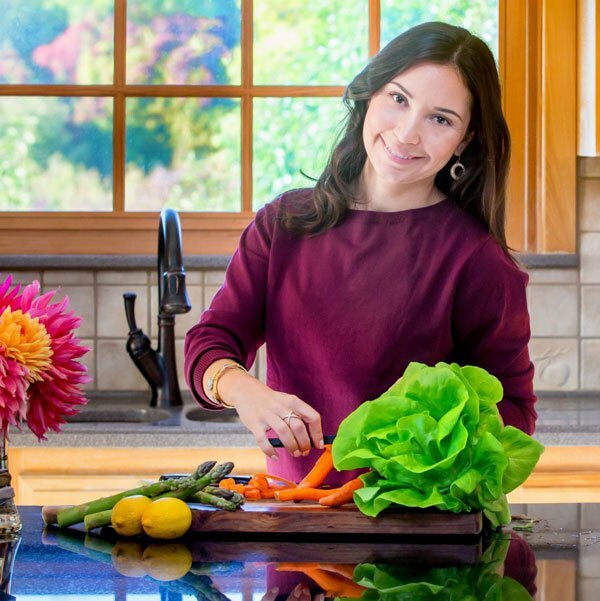 Food is a big part of the fun and I believe this is true for most homes. 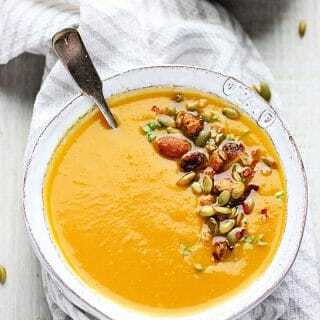 As I start to think of recipes for the Holidays, it is clear to me that I do not want to spend a lot of time in the kitchen, yet I want to be able to serve something incredibly delicious, fun and festive without the extra steps or lengthy ingredient list. 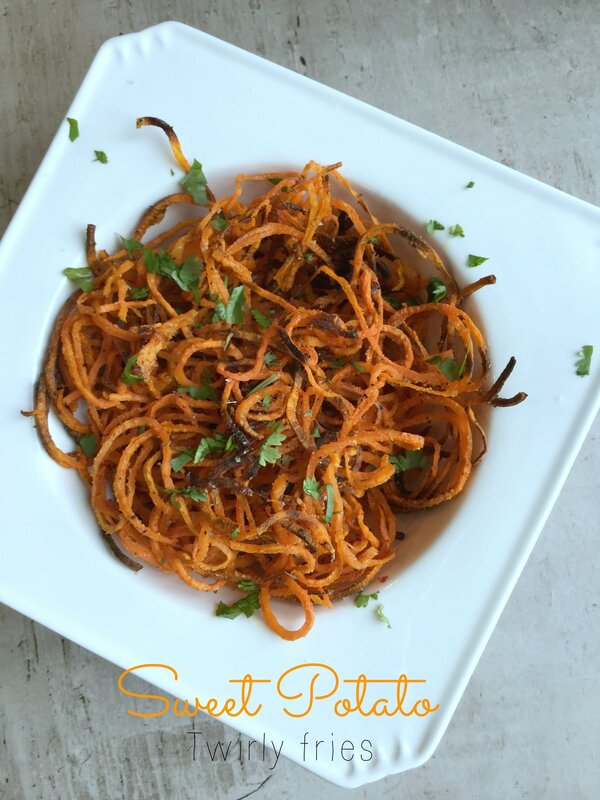 It didn’t take me long to decide on this recipe because everyone in my family loves sweet potato. 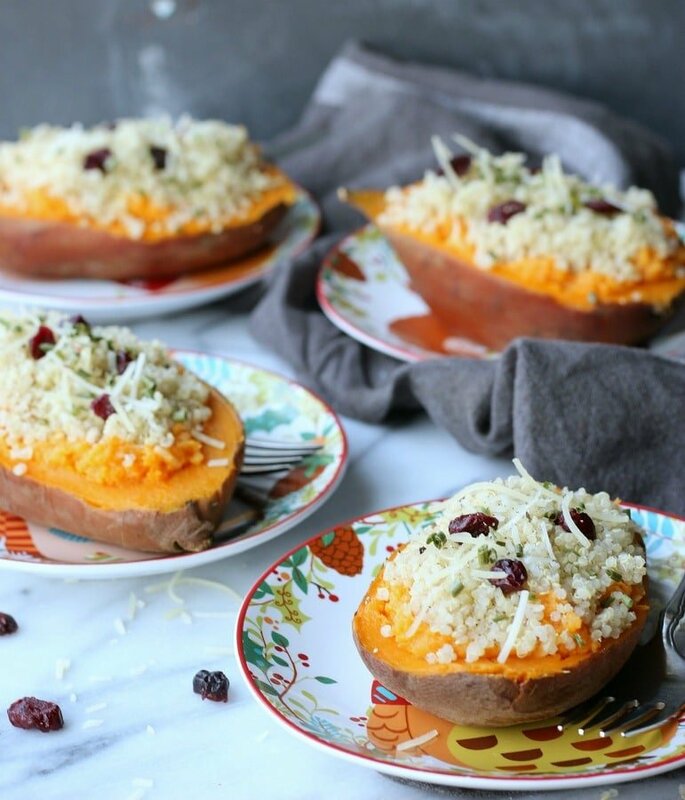 However, I wanted to take a step up on my sweet potato game and make something pretty, festive, fun and so delicious that will leave my guests asking for more… Do you think I have a good chance? 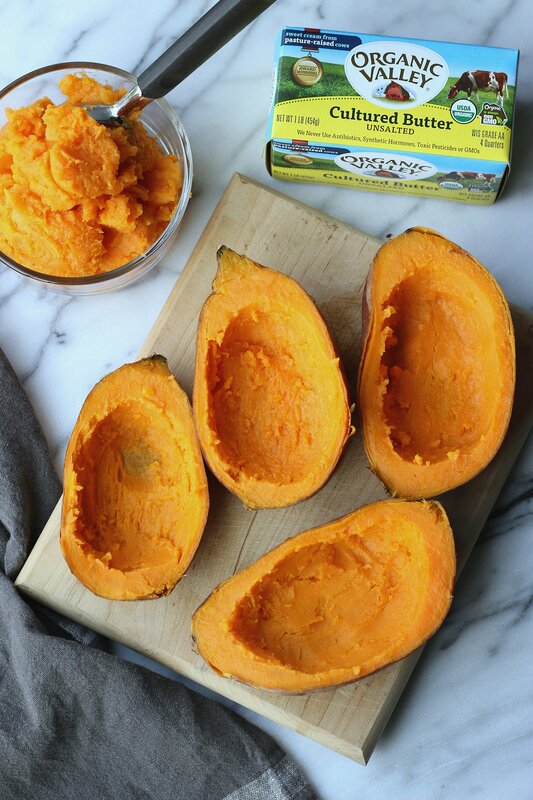 Scoop up the sweet potato in the center, leaving a half inch layer around the skin for support. 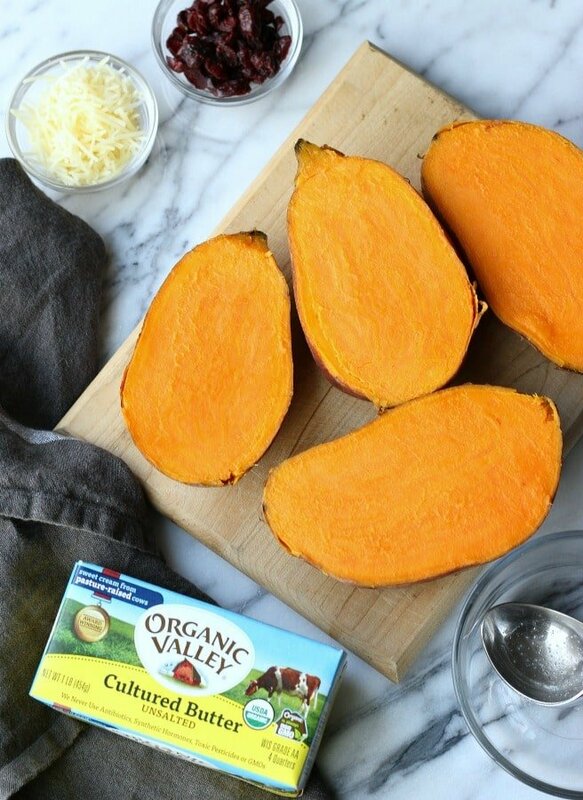 Add all that beautiful sweet potato to a glass bowl, then add Organic Valley® Unsalted Cultured Butter. I’ve learned that a high quality butter will make all the diference in a recipe, and that’s something I won’t compromise. Mix in some cinnamon and shredded cheese a pinch of salt and pepper, and fold or mash to combine. 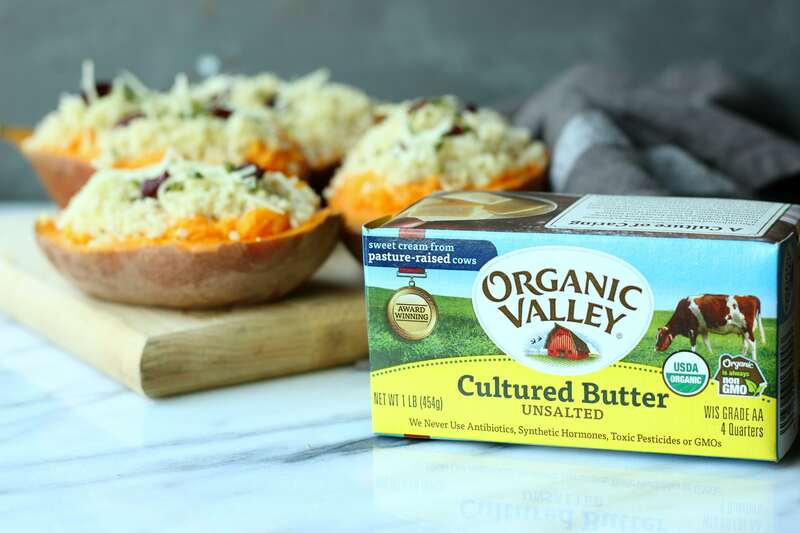 The tastiest and most nutritious butter and cream cheese comes from healthy, happy cows that spend their days in green pastures. You can trust all Organic Valley products are sustainably made without the use of toxic pesticides, synthetic hormones, antibiotics or GMOs. 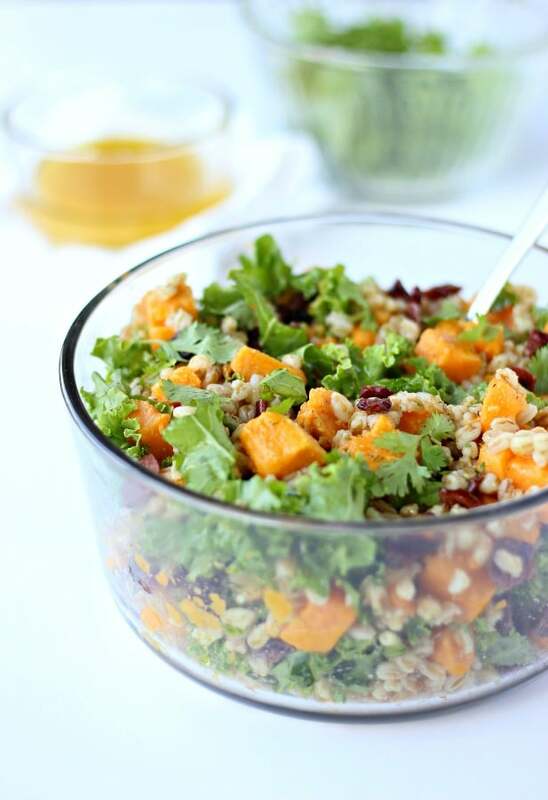 Now go ahead and pile a nice layer of quinoa on top of all that yummy buttery and cheesy sweet potato. Top with dried cranberries and chive for a perfect finish. Can you picture this beautiful plate on your Holiday table or bringing to the next dinner party? Either way I am sure everyone will enjoy this delicious and festive meal. 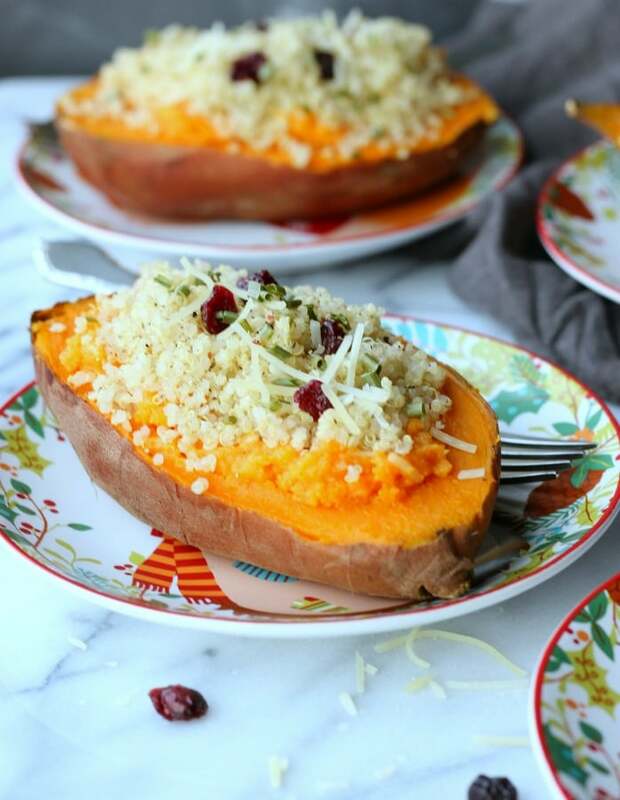 Baked Sweet Potato loaded with delicious quinoa, cheese and cranberries. 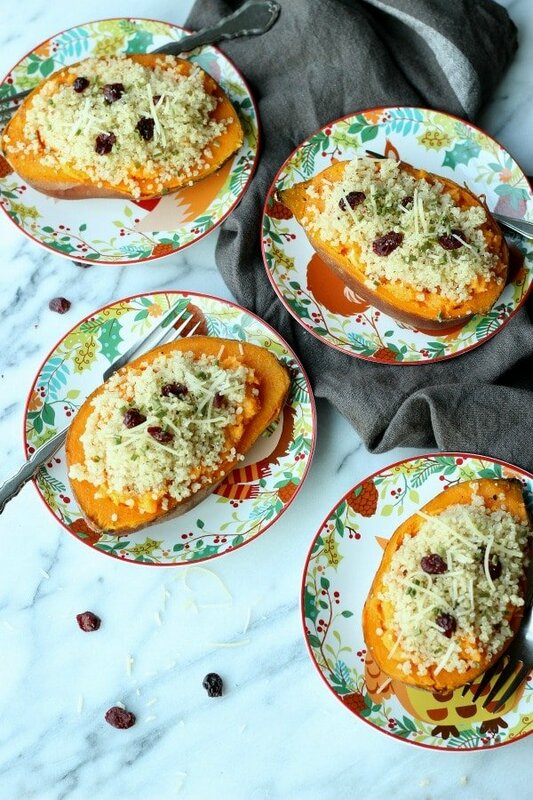 A perfect side dish for the Holidays! When the sweet potatoes are done, remove from oven. 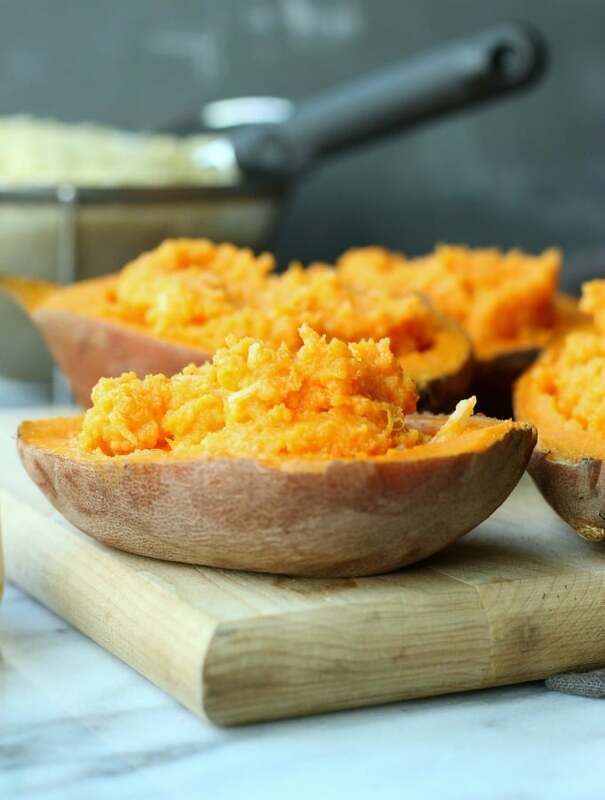 Carefully slice it in half (the long way) and using an ice scoop, carefully scoop up the core of the sweet potatoes leaving enough around the edges to create a "wall" to help maintain it's shape. 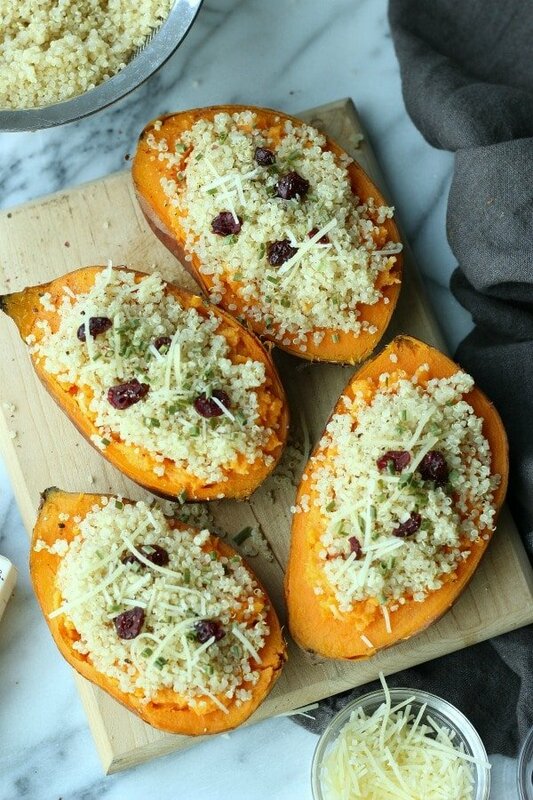 Add all the scooped sweet potatoes to a medium glass bowl, then add the butter, cheese, cinnamon and a pinch of salt and pepper. Mash or fold to combine. 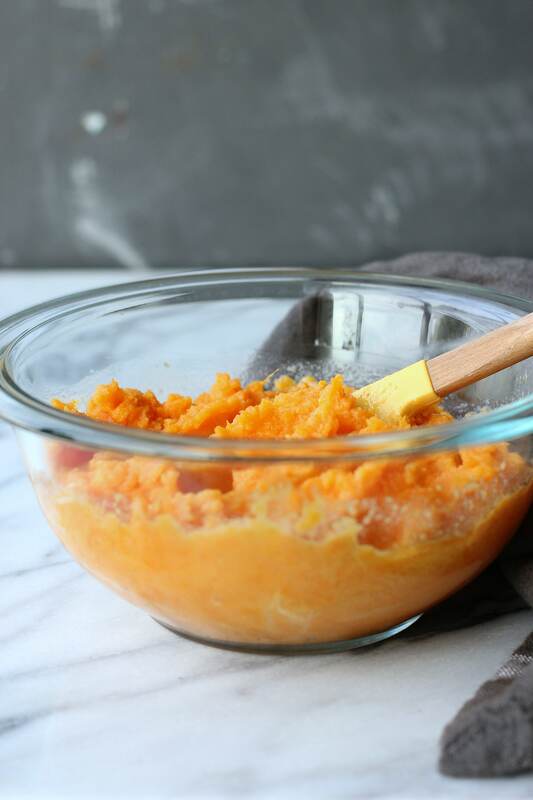 Spoon the mashed sweet potato back into it's skin. 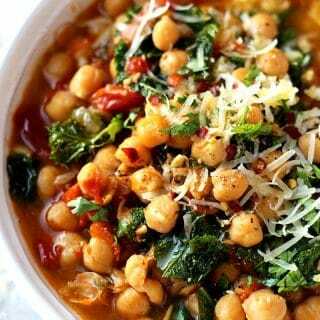 Add the quinoa, cranberries and sprinkle with chive or fresh parsley. Finish with more salt and pepper and a few cheese sprinkles. 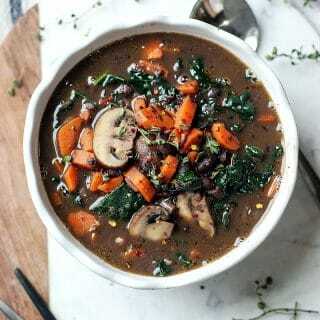 Serve hot alongside your choice of meat for a protein rich meal. 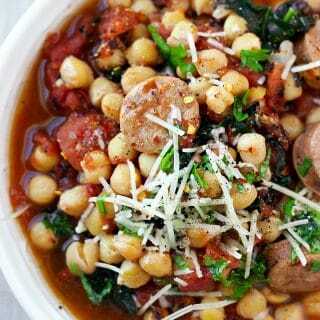 Would you do me a favor and SHARE this recipe with your friends and family? 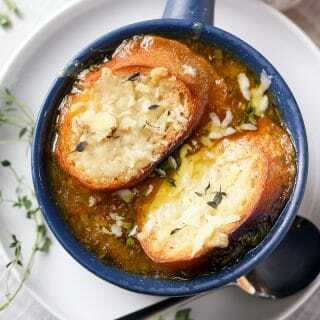 Or perhaps you have a group of foodie friends on Facebook, that would be delighted to try this recipe. Instagram is always a fun place to directly connect with me and learn about my latest trials (and errors!). 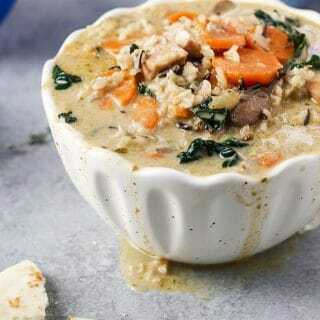 I am also always Pinning lots of delicious recipes or twitting away… hope to see you there! *This post was sponsored by Organic Valley. All content and opinions expressed here are my own.